So much excitement and all before 8am! This morning Paul comes in and tells the team over breakfast that plans have changed. 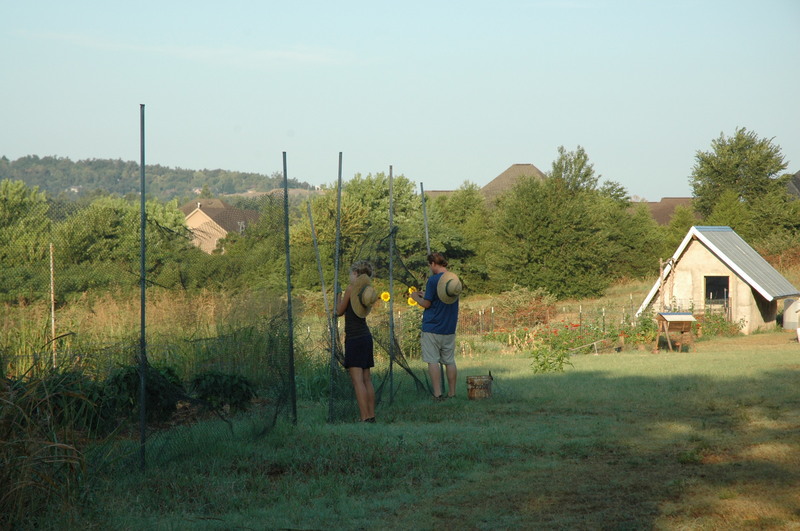 The original plans were to work on digging more row space or picking blackberries. However some of the eggs under the rumps of our diligent chickens are starting to hatch, so plan B, make a new coop for the baby chicks. 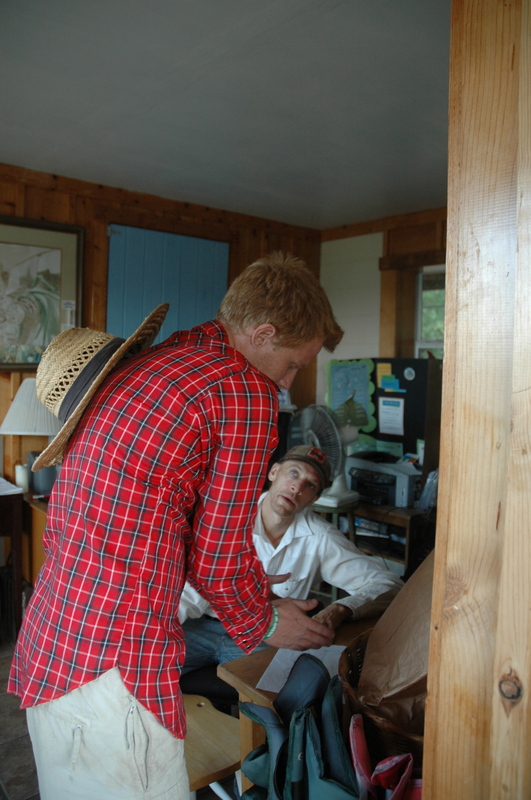 Paul and Patrick are discussing plans for the new coop. Finding materials to work with. 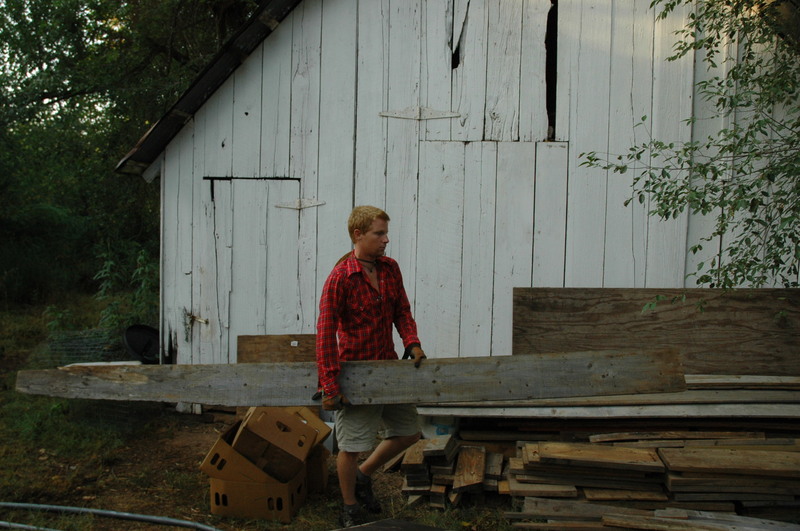 There are always usable pieces lying around. Pat is putting the pieces to be used into a pile. PS. Don’t call it a come back! The Missouri Angels were gone for about ten days visiting their family and such. 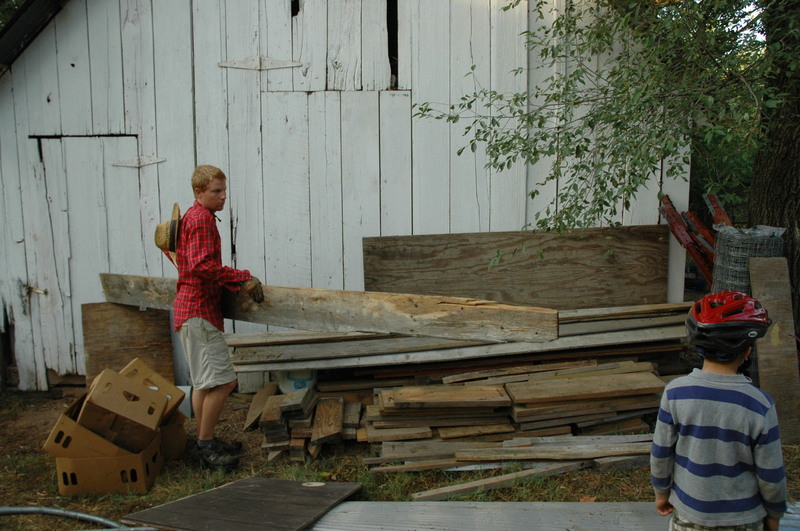 They made plans to go to New Mexico, but the farm there told them they were full at the moment, so they came BACK. They couldn’t get enough, and I guess neither could we. It feels really great to have their help once again. 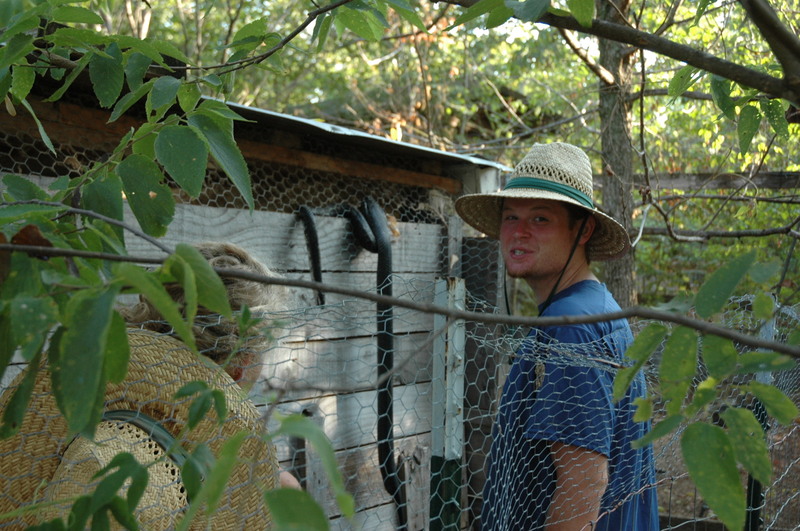 Jake and Laura are stitching the holes in our deer fence. So far so good on the security front, the sweet potatoes are still there. Laura is going to LOVE this picture! Sorry girl, I caught you blinking, but it’s funny. So I’m in the house doing some activities with the kids, when Paul comes in and tells me about a problem with the chickens. 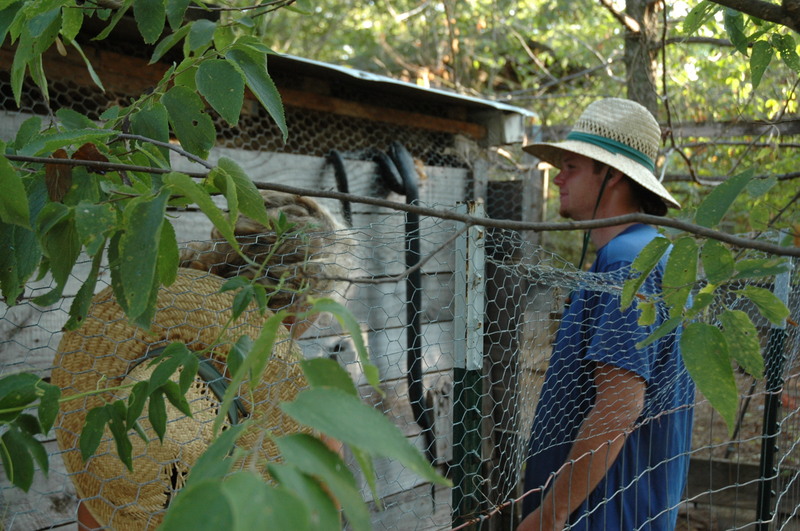 He mentioned how he had about four dozen eggs under four broody hens and that we have lost some to what he thought were other chickens. That may be true, but within his next breath he mentions a SNAKE. I gasp at the thought. 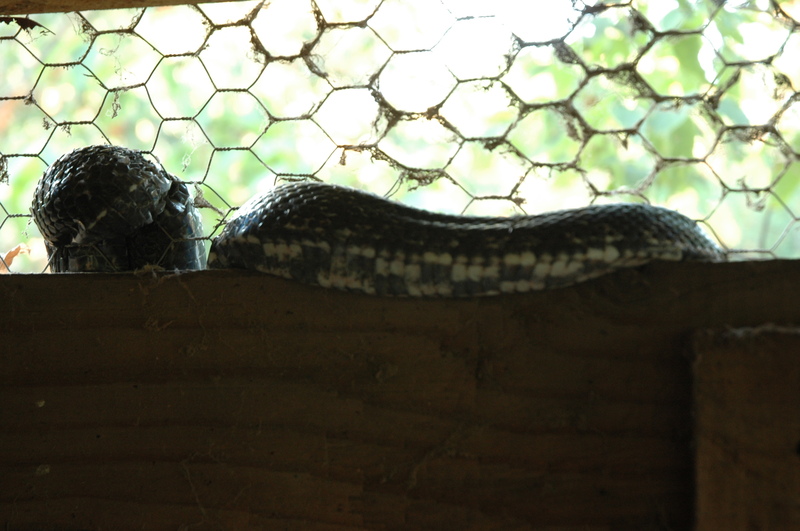 We were all excited about the possibility of babies, I don’t want to hear about a large rat snake entering the coop and eating them all. For some reason it made me think of the book Rikki Tikki Tavi. Then Paul tells me that it’s dead. Dead? Did you kill it? I ask. 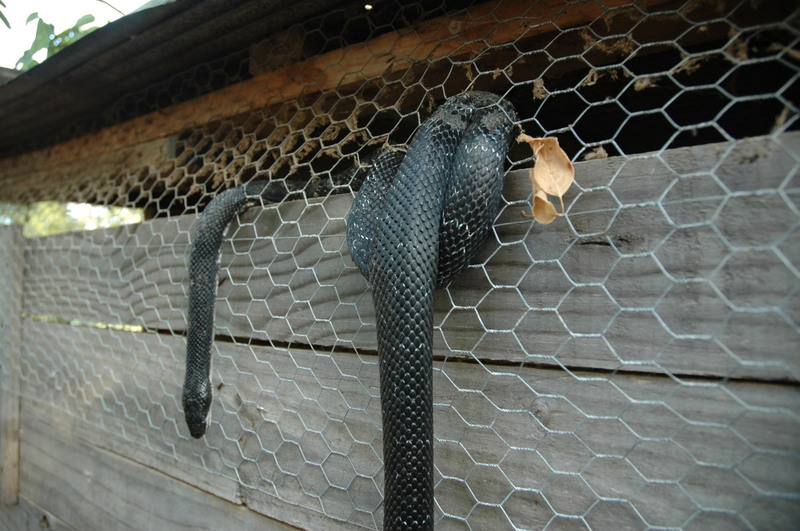 He explains that it somehow slithered through the top that is covered with chicken wire, realized that it wouldn’t fit and came back out. 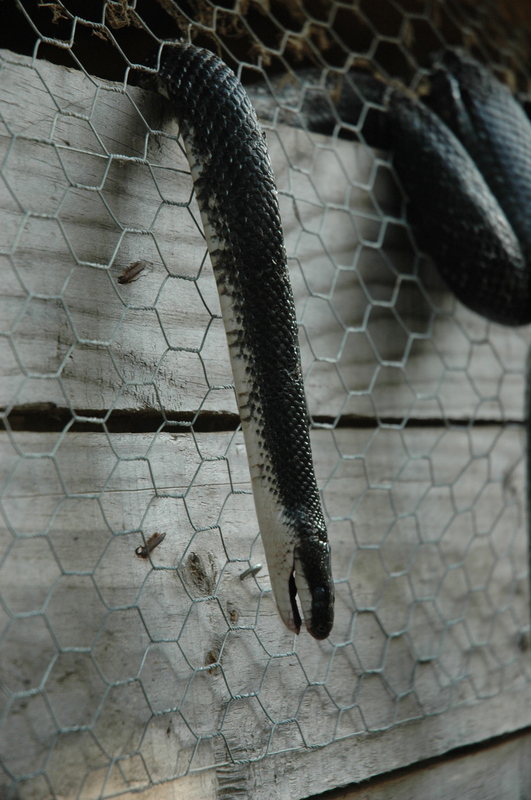 Mr. Rat snake must have been greedy and hungry, because it stitched itself back through the chicken wire one more time, only to meet its untimely death. 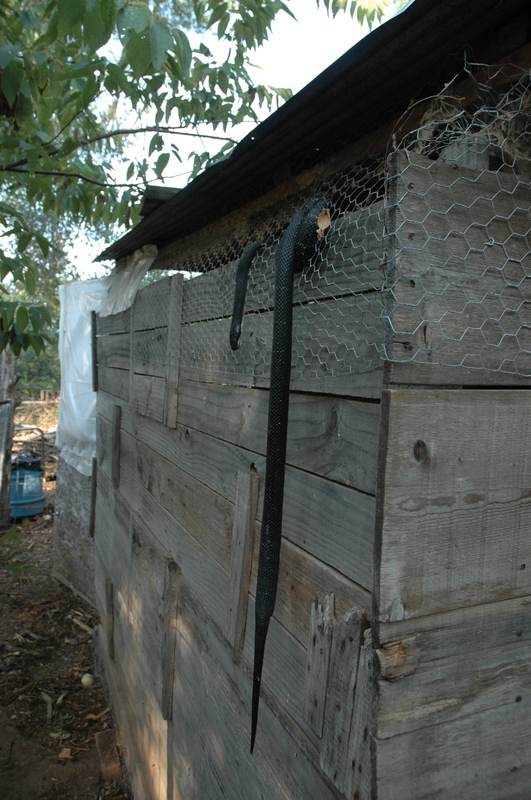 Chickens 1, snake 0. It totally grossed me out getting this close to a dead snake. 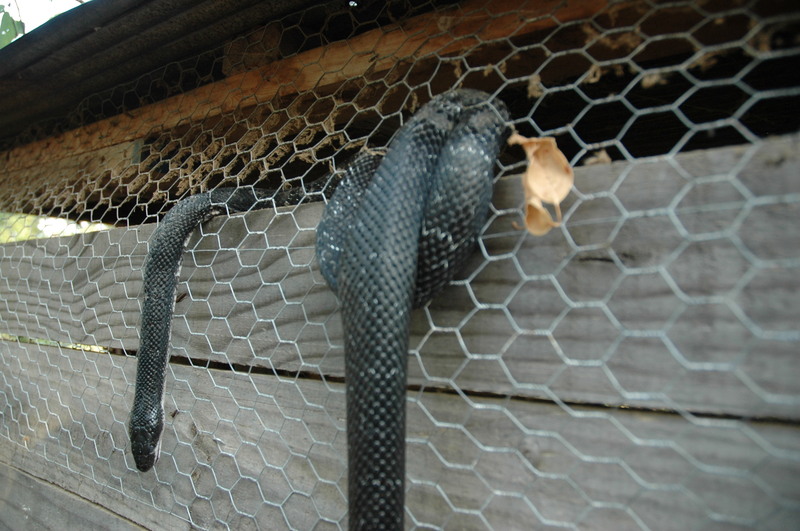 Jake “Snake” Jones, sharing a moment with his brethren. Crazy huh? We don’t know what to do about it. I personally don’t feel like cutting that snake out of there. So if there are any volunteers, please raise your hand! 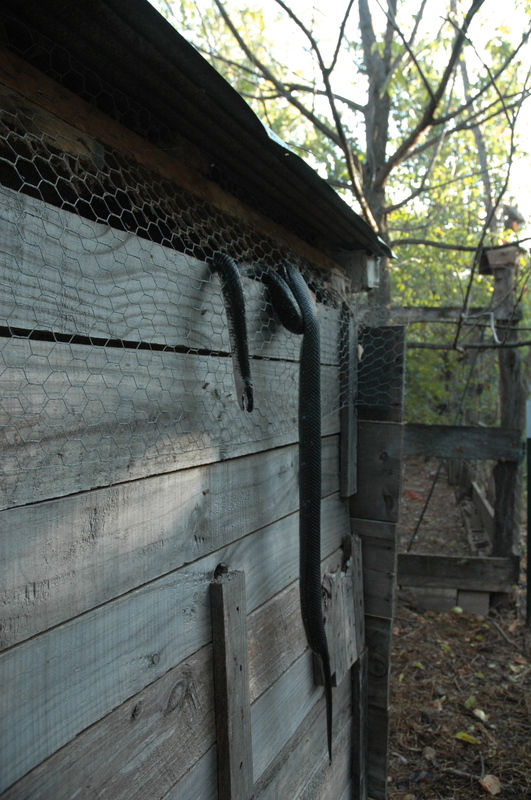 Maybe the snake can serve as a reminder to others to steer clear. That was one huge snake…so, is it gone or are you leaving him to rot…no one, snake, animal or huan will want to get anywhere close! I’m not quite sure what we’re going to do with it. With the heat today, it’s going to get bloated and yucchy. It already is. I bet it will rot off today. I don’t want to touch it! gross! that is exactly what happened to penny and larry when they put the bird netting over their shrubs, they got lots of stuck, dead black snakes and a few copper heads. so, are all the eggs gone? in a way this was good, now you get a better hen house!!! oh, by the way….yes you have to cut the snake out of the wire or waste the wire! That snake is HUGE!! Scary that those are underfoot while you’re gardening! :shudder: I’m getting the heeby-geebies over here.